This week is Mental Health Week, and I believe today is Mental Health Day. It felt poiniant to discuss mental health, especially as this is one of our pillars within The Business Cafe, creating the culture that helps us all to feel it is okay to have days when we feel less strong and times when we feel vilnerable and can reach our to friends. Last week Fiona Ross asked me to keynote at the launch of her Emotion Lotion book, I shared my milestones moments when I was tested and the learnings I gained from the challenges. I shared 8 of them, here I thought I would share 4 that jumped out at me today. 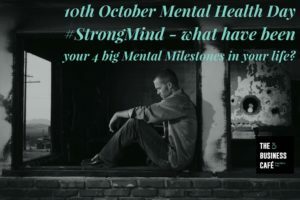 Writing down the 4 moments in my life when I became mentally stronger due to adversity and due to the need to grow as a person was a great exercise. Perhaps this is something you could do to celebrate yourself today. 1998 – becoming a business owner. The shift to the daily thoughts around the total responsibility of my income, life and those of others. Self reliance was my greatest asset, I had learned that in childhood and now I understood why. 2011 – learning to manage loss. When we could no longer keep the business we had built for 14 years and the terrible sense of failure, isolation, loss of self worth, embarrassment. Then the phoenix rose from within to keep striving and building a vision – learning that my personal brand was strong enough to withstand the loss of a business brand. I also learned that I hadn’t lost my purpose, only the first version of what I could visualise. 2012 – Scarcity. Building from nothing and being an alchemist. Seeing a vision and the excitement to fulfil it, but due to feeling desperate taking a short term gain and creating a longer term pain. Building a beautiful business with the wrong shareholder and investors in the Skills Sector, eventually I had to sell it to a larger company. Through this experience I learned that for great things to we achieved it takes courage to turn away people and opportunities that do not feel right. This is when I really learned to have voice as a business owner, not just a set of skills. 2013 – loneliness. The deep feeling of being on my own in business. Sitting in cafe’s working out my business with no one in my local town to talk to at those moments when you ned a ‘friend’ who truly understands what it takes to build a company. This is when I came up with the idea of The Business Cafe. The dream of a new concept, but I was aware that I needed someone to walk along side me to make it happen. That is when Gail Thomas and I became Co-Founders of The Business Cafe. I would love to hear your Mental Milestones, I wrote these in 5 minutes, they came ot me really fast as I scanned through my life. I hope they can give you a boost and that you can feel proud today of all that you have come through.